After facing allegations of misstated silicon inventory, the Chinese solar-cell company is on the rise with two new deals and an upgraded analyst rating. 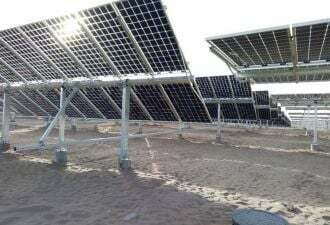 LDK Solar (NYSE: LDK) shares rose 3.8 percent -- and 14.2 percent from a low of $31.33 per share Wednesday -- to close at $35.78 per share Thursday after announcing two deals in two days. The company said Thursday it had inked a 10-year agreement to supply wafers to Neo Solar Power and Wednesday said it had signed a "long-term" contract to buy trichlorosilane -- the silicon, hydrogen and chlorine compound from which high-grade silicon is often made - from Jiangxi Ganzhong Chlorine & Caustic Co.
LDK said the deal with Jiangxi Ganzhong, which calls for a minimum of 400 tons of TCS per month to be delivered starting in May and a minimum of 1,600 tons per month to be delivered beginning in August, secures all the TCS that LDK needs for its expected polysilicon production. In an earnings call in December, LDK CEO Xiafeng Peng said the company had begun construction of its first polysilicon plant and expected to have the capacity to produce 7,000 metric tons of polysilicon annually by the end of this year and 16,000 metric tons by the end of 2009 (see LDK Profits Jump 40% and LDK Shores Itself with New Silicon Supply). Nick Sarno, senior vice president of manufacturing, said the company was aware making polysilicon "is not going to be as easy as making wafers," but added that it didn’t foresee the production of TCS to be a major risk. While LDK’s share price is still 53 percent of its peak of $76.75 per share in December, it is rising against a tide of falling solar share prices. Among others, Evergreen Solar (NSDQ: ESLR) fell 5 percent to close at $12.09 per share Thursday. In spite of an announcement that it signed an agreement to buy 458 metric tons of polysilicon from M.Setek, JA Solar (NSDQ: JASO) fell 8 percent to $56.06 per share Thursday. And SunPower Corp. (NSDQ: SPWR), which announced two agreements to buy 2.5 gigawatts worth of polysilicon from a NorSun joint venture plant in Saudi Arabia, fell 11.6 percent to $80.96 per share. In a research note, Thomas Weisel Partners analyst Jeff Osbourne wrote Thursday that the TCS partnership "should reduce some investor concerns given that this material is in [incredibly] tight supply." "While LDK has been plagued by an accounting scandal in the past, which has led to a great deal of investor anxiety and stock volatility, we believe the new polysilicon factory they are developing is the real deal," he said. "In handicapping the success they will have versus the 67 other proposed plants in China, we believe they have much higher odds of success given the top-notch equipment they are using from GT Solar as well as strong partner in Flour for engineering and planning." Still, he said margins will likely continue to fall for LDK, bottoming in the first quarter of 2009. LDK, which had been facing allegations of discrepancies in its silicon inventory from a former financial controller, in December announced that it had been exonerated by an independent audit (see Independent LDK Audit Finds No Material Errors, New Details Surface as LDK Stock Continues to Plunge and LDK Says Inventory Allegations Have ’No Merit’). Earlier this month, CIBC World Markets upgraded LDK from "Underperform" to "Sector Perform," after downgrading it from "Sector Outperform" to "Sector Perform" in September and to "Sector Underperform" in October.